There was a time when solo travel for women was unheard of. Well, not anymore! Baby boomer women today are challenging stereotypes and living life on their own terms. They are exploring the world, even if they don’t have someone to travel with. But, this raises an interesting question. How can you stay safe, while traveling alone as a woman? In a perfect world, solo female travelers would not need to worry about personal safety. The reality, of course, is quite different. Whether we are at home or in the midst of a solo travel experience, we women must be aware of safety concerns and take steps to protect ourselves. If you’re planning to strike out your own, these six solo travel tips can help you stay safe. Situational awareness involves using your knowledge and the information your five senses provide to understand what is going on around you and what could happen in the future. Improving situational awareness typically involves taking some or all of the following steps. Be travel-savvy. Find out what safety issues exist in the places you plan to visit and learn how local women cope with them. For example, if traveling alone at night is not safe, even on public transportation, a local might call, rather than hail, a taxi, or she might have a large group of friends walk her home. Be culturally informed. Learn what women typically wear and do in your destination country and adjust your wardrobe and conduct so that you are within acceptable parameters. It’s almost always a good idea to dress modestly and avoid blatantly flouting local customs. Be street smart. Know how to get around safely once you reach your destination. Find out whether public transportation is safe to use during the day and at night. Avoid arriving at your hotel after dark. If women-only subway cars and buses are available, use them. Learn how to identify licensed taxicabs. Carry a whistle, flashlight and, if legal, pepper spray. Be ready to cope with nature’s surprises. Research natural disasters and weather conditions that could affect your trip and learn how to stay safe in a hurricane, earthquake, tsunami, tornado or another catastrophic natural event. Be observant. As you travel from place to place, look around and notice what people are doing. Check for emergency exits and notice what is going on around you. Be clear-headed. Don’t over-indulge in alcoholic beverages or walk around by yourself while reading email on your mobile phone. And, of course, never leave your drink unguarded. Wherever your travels take you, there will be people ready to relieve you of expensive jewelry, electronic items and travel documents. Minimize your risk by leaving irreplaceable valuables at home. Make copies of your passport; carry one copy separately from your passport and leave a copy with a friend or relative. Wear a money belt if you are traveling to places that are famous for pickpockets. Leave your expensive clothing and accessories at home and dress to blend in. Avoid wearing items that advertise your national origin, such as American flag pins, maple leaf T-shirts or baseball caps. When talking with others, don’t mention your hotel room number, name or address. Someone could overhear your conversation and follow you back to your hotel. Before your trip begins, look up the emergency telephone number for your destination country and memorize it. If you are traveling with a mobile phone, add that number to your contacts list. Learn how to shout for help and alert others to fire danger. Write those phrases down on a card and carry the card with you during your trip. Solo Travel Tip: If you have serious or life-threatening allergies, include your allergy information on that card. Ask someone to translate the information into the local language for you before you leave home. As you get into your rental car, lock the door and close it right away. Lock valuables in the trunk of your rental car; don’t put them in the glove compartment or under your seat. Lock the car whenever you park it. Thieves know all the tricks, but they also know that locks will slow them down. When you enter your hotel room, close and lock the door. Use all the locks on the door. For extra security, pack a door wedge or door alarm and use it whenever you are in the room. Never open your door unless you are sure you know the person on the other side. Don’t leave your window open at night if you have a ground floor room. Solo Travel Tip: Better yet, don’t accept a ground floor room in the first place. Try for a room on the third floor instead. This tip may seem hackneyed, but it is actually the foundation of personal safety. If something doesn’t feel right, trust your instincts and move toward a safe place or a group of people. Your “gut feelings” might include a prickly sensation, knots in your stomach, heightened awareness or a compulsion to run away. Believe in yourself when your instincts warn you of trouble and head for safety immediately. Do you have solo travel tips to share? How did you prepare for your solo travel adventure? Share your tips and experiences with us in the comments below. Nancy Parode launched her freelance writing career in 2005, but she has been traveling, observing and writing for most of her life. Nancy shares her senior travel tips and itinerary ideas as About.com's Expert on Senior and Baby Boomer Travel. She has written for print magazines and travel websites and has been featured on WRVO Public Media's "Take Care" radio show and BlogTalkRadio's "Transformed Traveler" show. 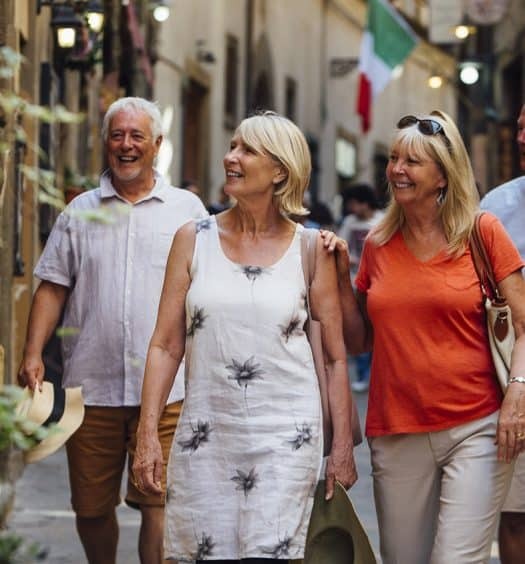 Stress-Free Travel After 60 is Possible – Just Don’t Forget Your Magic Wand! I only travel locally and travel armed when the law allows. I’ve also taken self-defense and kick-boxing classes. Generally, I stay physically fit so I’m able to take care of myself. When ive travelled alone,I would have my money belt on me,a phone at hand ,checked out prior to travel a plan,and always be ahead of time for trains etc,and never put myself at risk in an area where theres hardly anyone around,carry a small gun ( only kidding), I would however like to purchase Mace ,having been on a train where 2 drug fuelled yobs were picking on 2 elderly people,and I intervened,and they were right in front of me till I got off the train,i felt I needed it just incase they didnt leave those elderly people alone.Stay safe !